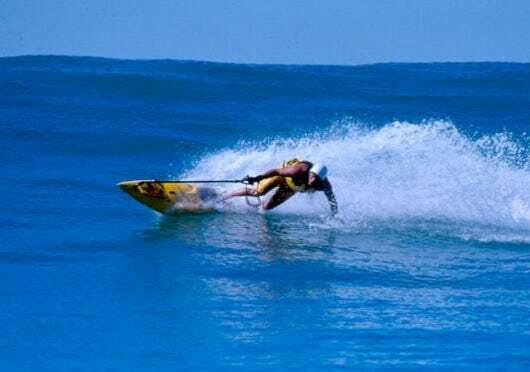 Let’s take a look at PowerSki JetBoard, it is a legend in the motorized surfboard niche, and one of the most impressive water toys invented. A true engineering masterpiece; the inventors displayed a level of outside the box thinking by taking the regular surfboard engine and creating a smaller and flatter engine with massive horse power capable of reaching speeds of 40 m/h! The rear thrust, rail and the three fins are all located underneath, this allows the JetBoard to slice through water, tarmac or snow with poise. It is also capable of generating G-forces up to 6G; this is amazing because it allows the rider to go almost horizontal! With the PowerSki JetBoard, it is almost impossible to slide out; this has the added advantage of being able to stand while performing continuous quick turns and maneuvers with slight weight shifts. This makes it ideal for performing stunts, as it has been engineered to deliver the necessary power and maneuverability to get the job done. Due to this high power and maneuverability applications, JetBoard is not only ideal for cruising on flat water, but it can also utilize waves in both directions allowing you to position yourself anywhere you want. The JetBoard is about 2.54 meters in length (100 inches). The rider can maintain balance by gripping the handle of the board; a 4 foot long semi-flexible fiber arm. Start/stop buttons, thumb throttle, and safety kill switch are all available options incorporated into the handle’s function. It is also designed in such a way that your hands won’t get sore using them, so there’s no need to worry! So if your thing is speed, style and stunt, then maybe you should consider getting the PowerSki JetBoard and enjoy the amazing experience of G-Force!